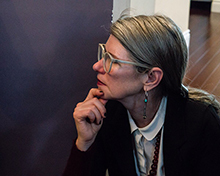 Lisa Robertson is the author of the poetry collections Cinema of the Present, The Weather, Debbie, and XEclogue, and the essay collections Occasional Work and Seven Walks from the Office for Soft Architecture and Nilling. She was born in Toronto and lived in Vancouver for many years. She has taught at universities in the US and Europe, and now lives in France.